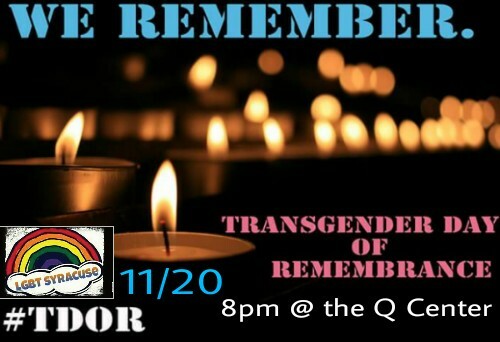 LGBT Syracuse has joined forces with the Q Center to honor the National Transgender Day of Remembrance. We are hosting a candlelight vigil to honor those in the Transgender community that have been taken away from us because of anti transgender hatred, prejudice and violence. Transgender Day of Remembrance serves to raise public awareness of hate crimes against Transgender people. Please bring your friends along and join us in supporting our community.